I’m well into my second week of the VB6 plan, minus a couple days falling off the horse (and rolling down a spikey hill into some traffic). I started the week with another big grocery shop for piles of veggies, tofu and some grains and nuts and a list of recipes and meal ideas. On the first day I made a coconut saucy mix of zucchini, yellow squash, mushrooms, corn and peanuts which I served on the farro/quinoa mixture I had frozen the week before. I was so glad to find that because I would have resorted to making a pile of white rice which a doctor once told me was as good as eating a bowl of sugar. I do still eat white rice here and there but was working on not eating any white stuff like bread so it was nice to have a healthier alternative at the ready. I sprinkled the dish with fresh cilantro and basil and was super happy with it. And, for the first day on the diet found I was not hungry for several hours. The night before I had made an edamame, tahini, lemon spread to have as a snack. It is not quite as good as I want it to be, but it brightened up a bit overnight and was pretty good on a couple brown rice crackers in the afternoon. Next I plan to make the porcini pecan pâté I discovered during my first Meatless March. It seems so decadent and would be a great snack as well as a swanky addition to some grilled chicken or steak at dinner. That afternoon I took my daughter to yoga where she gets half yoga/half crafts and I get an hour and a half of intense Iyengar. I had not been able to go as regularly as I used to and was grateful that my hope for mindfulness in eating was spilling into other areas of my healthy living plan. After yoga I made a simple broiled salmon with pan crisped broccoli and mushrooms with the rest of the farro/quinoa on the side. I made a simple drizzle of browned butter, soy and black vinegar. Quick, fast, omega goodness. Tuesday was mostly slow cooked oatmeal, leftover tofu/corn/coconut glop (for lack of a better word) and an apple. I also squeezed in a 13 mile bike ride to and from our shop despite the 97 degree heat (blech!). 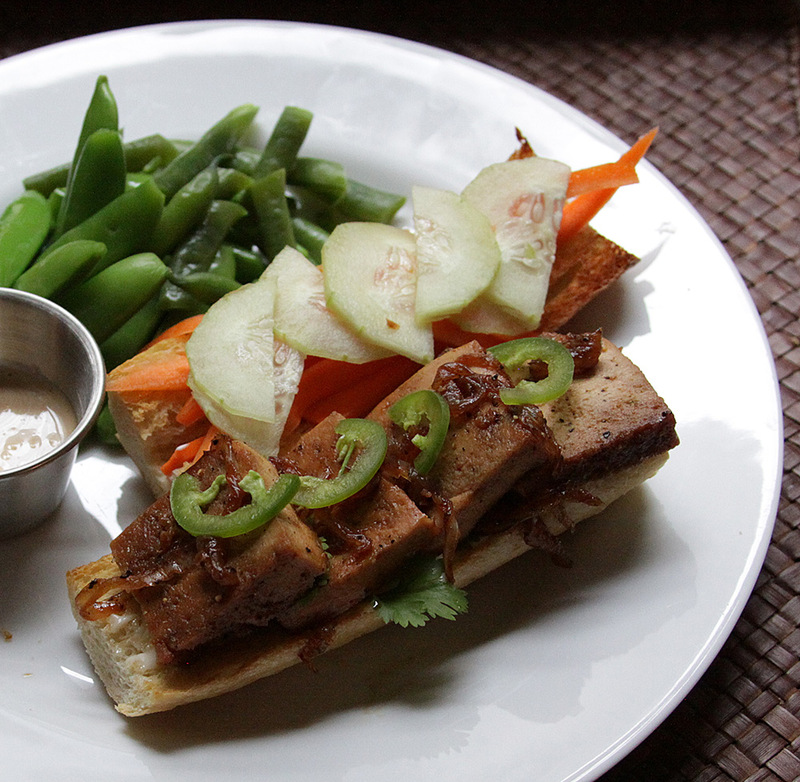 The day before I had seen the words “caramel tofu” on 101cookbooks.com and in searching other recipes came across one on Slate that made a caramel tofu banh mi. And what a coincidence, they had taken the method from Mark Bittman. This recipe recommended freezing then thawing the tofu to change the texture. The ice crystals that form make little pockets in the tofu and supposedly change it to be chewier. So I took the tofu from the freezer when I got home and finished my work day. After I picked up my daughter, I set about making the dish. She helped me peel carrots and cucumber and made her homemade “lunchable” for school the next day. I melted sugar into caramel, stirred an equal mix of fish sauce and soy into it and simmered onions with black pepper (a little too much it turned out). I added the tofu pieces and flipped a few times until there was no real sauce left. I had also tossed some carrots and jalapeños in rice vinegar, agave, chili sauce. It all got piled onto some sourdough baguette I had picked up the day before topped with cilantro, mayo, basiland cucumber. My daughter, meanwhile, had mixed up a “dip dip” for some sugarsnaps I had blanched the day before. It was a really, really good sandwich. It bordered on a bit too peppery and a touch too salty so I would tame those a bit next time, but the overall ease, cost and flavor POW means this dish will be making many appearances from here on out. The funny thing is that it is the same flavor profile of the amazing pork chops I made a couple weeks ago from Bon Appetit. I think lime would be a great addition. This entry was posted in Sandwiches, VB6, Vegetarian, Vietnamese by Marina Chotzinoff. Bookmark the permalink.